From literature to tattoos, jewellery to films and indeed a flag - I grew up in Wales; speaking of which who can forget Idris the Dragon from Ivor the Engine! I love to see Dragons. I actually surprised myself when I came to write today's post to discover I had 7 dragon or dragon themed beads, it's surprising what you can forget about when you collect a lot of beads! 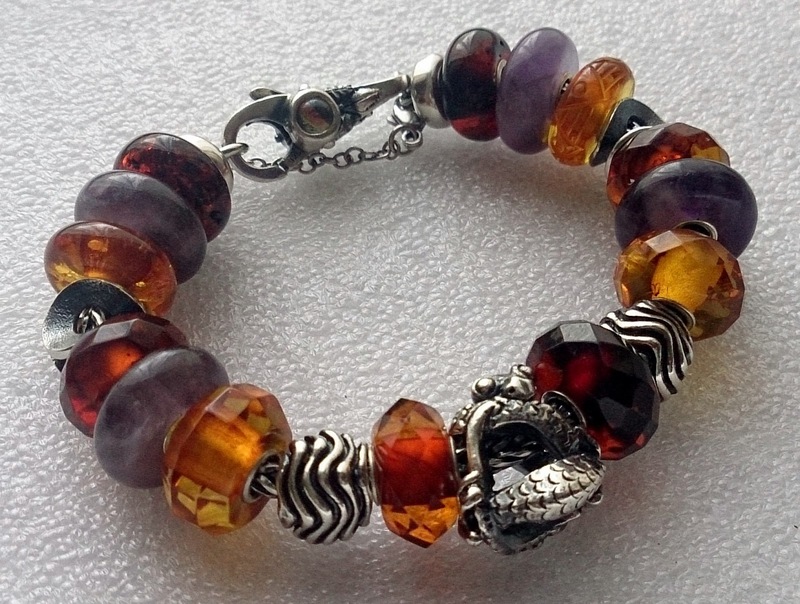 My very first Trollbead was a Dragon, although technically it's a Wyvern as it only has 2 legs not 4! I picked up the Hong Kong World Tour - Dragon and Phoenix Bead when the World Tour beads became available to buy in the UK and Lucky Dragon from the People's Bead Spiritual Collection on the day they were released, it arrived just in time for me to go on holiday but that's a whole other story. 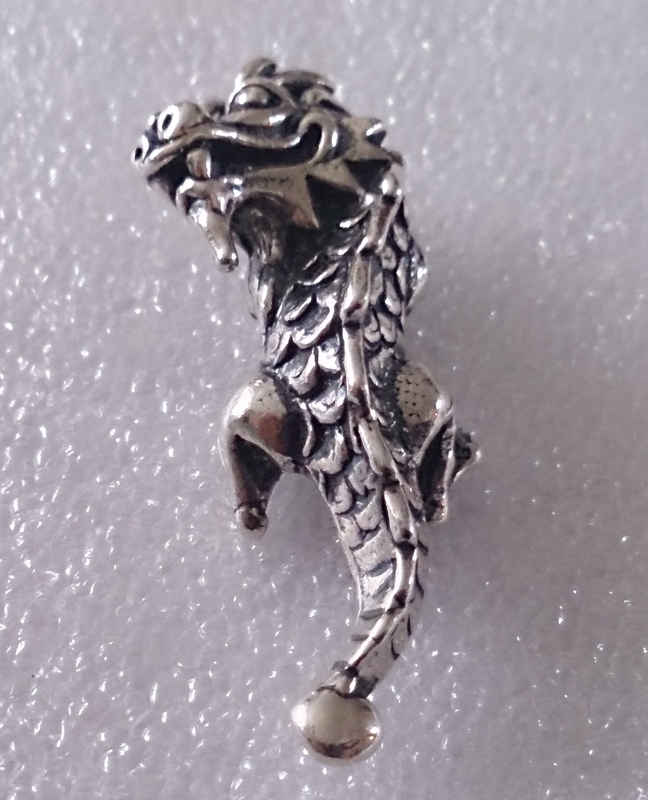 I was over the moon when I found a Limited Edition 2009 Chinese Silver Dragon for sale preloved (for non bead folk reading this, these are incredibly hard to get hold of - even more so at a fair price). So that took it to 4... then along came Naughty Dragon, technically he's a necklace pendant rather than a bracelet charm, and yes, he is a he! Then again on the preloved market I was lucky to pick up Baby Dragon which is technically a splitter bead (a bead with 3 holes so you can split off a long chain necklace to shorten it) and usually to be found on my Pearl Fantasy Necklace, although I'm currently wearing Baby Dragon on a bracelet at the moment. Finally, and last but not least is my Story by Kranz and Ziegler Dragon, I just love the way the foot (or is that an arm?) that are visible hold onto the lambskin bracelet! So now everyone's up to date with my current Dragons... on my ultimate Dragons Wish List (read = never going to happen) is a Faerybeads Dragon lock... along with most of their Through the Magical Door Collection... anyone got a money tree? I am sure a lot of people are obsessed with dragons. I certainly like them and wish they were real and living creatures especially the wise and benevolent ones found in some fiction and it would shake people up a bit to deal with ones not so benevolent. :) Your charms are delightful. Thanks Cecila, I was surprised I had so many when I started to gather them together! I love reading about Dragons in fiction, it pretty much sells any new book to me before I've checked out if I like the author's style. I'm not into dragons per se, but my collection revolves around the world of fae. Some days I too wsh for a money tree to get those pieces that seem just out of my reach. Glad to know someone else has the same "problem"! Yeah, I probably should have asked for a money orchard rather than just a tree... or is that too greedy? I don't mind buying preloved/2nd hand so that helps with some peices providing someone wants to let them go! 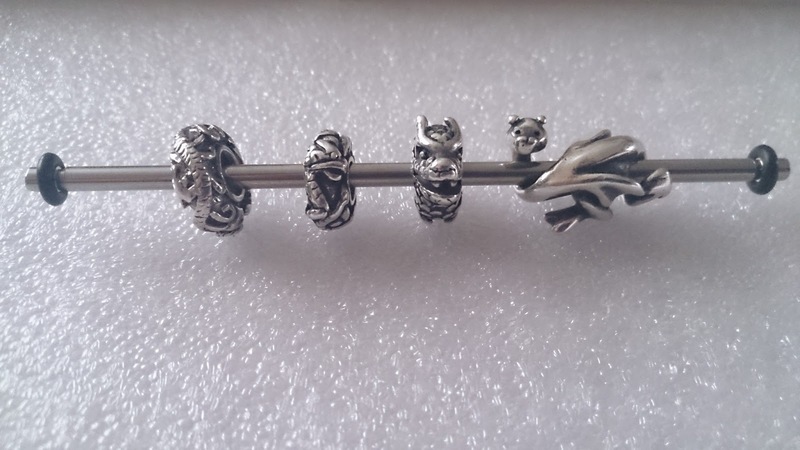 I do like dragons, although I didn't like the way that the Lucky Dragon sat on a bracelet so I no longer have that one. The Baby Dragon gets quite a bit of wear on my leather bracelet though. Ah we posted at the same time! Yep the way Lucky Dragon sat I think had something to do with how quickly I filled up that first bracelet to try and keep it in place ;) I love Baby Dragon, first bracelet I've put it on but I think it works, love how you wear yours on your leather too! I was soooooooooooo lucky with the LE 2009 one, I would love the rest of that set - had I been collecting when it came out I'm fairly sure I would have bought the whole set. Naughty Dragon is just great... because of the A to Z challenge I didn't want to show the other side but I'm sure if folk are curious they'll be able to find out why. I think Faerybeads are on a lot of people's wishlists, it's just not something I can justify at the moment, the time is creeping closer for my boilers to get the treatment, and my car is starting to develop some fatal looking flaws at the moment so I've got a weather eye on the future! Blimey spelling mistakes and repeated use of words abound... think I need another coffee before I finish my lunch break! Nice post with good images. Dragons are one of my favorite mythical creatures as well and with Game of Thrones and The Hobbit the world is full of them. Thanks for visiting, glad you popped in it means I've discovered your site. Love the podcast! Well, I can honestly say I've never met a dragon I didn't like! While I am not that into dragons, your jewelry is quite beautiful and unique. Thank you for sharing your dragons with us. Those dragon beads are beautiful! I just love Trollbeads, though I don't own any myself (not yet anyway). Thanks for sharing them! If you want to see it at it's height my C for Collecting post from yesterday tells a heady tale of a whole weekend of Troll with friends. Thanks for taking the time to come find me! 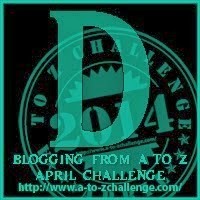 Good luck with the rest of A-Z! I don't think my taste/style of jewellery has changed that much, just that I've substituted the materials now I'm older and can afford to (and perhaps not leading such a reckless social life where I'd lose/damage it is another key point). I have a naughty Dragon... who is my special companion Hub offered me last year for Valentines ;) and I wear it on a bangle (it really works!) with twon onyx on each side and the special WT Hong Kong Dragon and Luck !!! Hi Patounette! Thanks for stopping by, another Dragon fan \o/ yay! 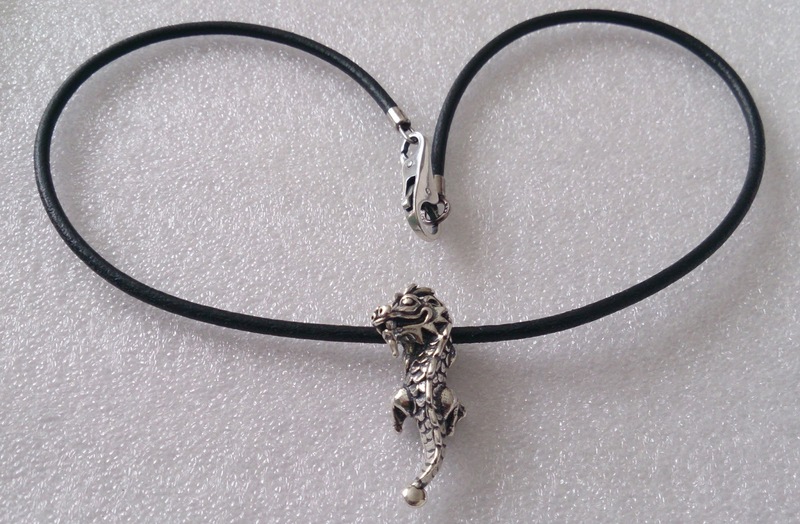 I love Naughty Dragon, I've been wearing him on a leather but I've finally been able to get a silver Troll necklace to put him on in a recent sale. He was on my wish list for a very long time before I picked him up. Baby Dragon is really lovely, and very versatile, I love him on a bracelet as much as using as a splitter bead, have also seen him look lovely on a leather but I haven't quite mastered that effect myself yet! How long have you been collecting Troll? It seems that I can't manage to change beads on a blet once I've found the right place ... my prob was what to do if I find a bead I love, which can't fit with a theme so I dedicate a leather to the lost ones ... very eclectic but it doesn't hurt my obsession of each bead matching the others with a special idea and theme !!! Does it sound creasy ???? No, I'm always fascinating by how people collect beads, I favoured the ooh shiny approach for ages and rarely collect towards a theme. Now, later on in my collecting I'm starting to do that more, not a permanent theme but ideas I have for specific bracelets, there's one coming up tomorrow but I shan't say anymore as it won't publish until the 9th April, there's also another one later on in the alphabet. Ever since the bangle has come along that has helped with my lost beads, but I have done the same with leathers too, I quite like a brightly coloured mish mash of beads on those! (Especially if I'm just in jeans and a black jumper). The only issue I have with making and breaking all the time is the amount of storage needed for the beads... it's easier to store bracelets than beads so I have the opposite problem to most people I know. LOVE LOVE LOVE these dragon beads. Especially that naughty dragon one, but all of the are lovely. Naughty Dragon is a show stopper, he's lovely. I'd always wanted this bead and after seeing a friend's in real life (the friend I've blogged about today under G) it was a cert! I love dragons (you can't tell can you? ), and despite being a fan I didn't actually recognise him as Smaug due to the fact my brain just disengages from everything when I watch films, especially hte bit that links up to memory! Husband was totally amazed I didn't link the two together, but as I said my brain turns to mush when I watch a film! as a fellow taffy I too love a good dragon - and Ivor for that matter:) have a dragons head which I took into exams with me - not that I believe in these good luck talismans - however i did pass! :) had a few bits during the years but am allergic to many metals - have been looking at the the non metal ones lately and wondering whether. . . .
Ah another Dragon lover, there are more of us around than I thought! Congrats on passing your exams. I sympathise with being allergic to many metals, my mum is also and she can wear so few pieces of jewellery. I guess if you know which ones you are allergic to you could always ask the jewellery brand if they use any of those in their pieces? If you see anything you like on my blog then please ask the question and I will see if I can get any information for you. I am not a fan of dragon symbols/emblems, but pieces that were made by artisans are an exception. I'm still waiting for Biltmorelux.com to upload a home decor with a dragon symbol. If I'm gonna own something that has a dragon symbol in it, then it has to have some real value.